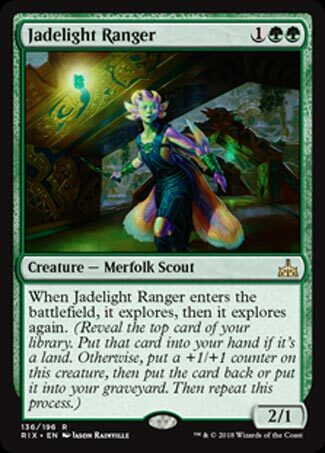 Jadelight Ranger is a deceptively powerful card, warranting the current high price. Explore is the perfect example of a “workhorse” mechanic. It’s not the most exciting ability to read but it fixes your next turn while potentially making your creature bigger. I bet Explore will rank high in the “Storm” scale. Its powerful, can go on just about any creature, and isn’t tied down by lore. I hope we see it in conjunction with Landfall when we see Zendikar next. So what’s better than Exploring? Exploring TWICE. Having a card go to the graveyard might be considered a downside but Golgari players know this is a positive. Delirium might be out of standard, but Emblam and Aftermath aren’t. In limited this card can be put into any deck with green, but it of course wants to end up in a Merfolk deck. Jadelight Ranger might be the best card from the most least popular tribe. It’s a 3 mana 2/1 that drew two lands off the top off your deck, improving the chance that you’ll get gas in your subsequent turns. It’s a 3 mana 3/2 that got you a land and gave you information about your next draw or got rid of a card you have no need for. It’s a 3 mana 4/3 that gave you information or got rid of cards you don’t want to draw. What’s not to love about it? Regardless of what mode you get, Jadelight Ranger is a powerful source of card advantage, and it’s in one of Ixalan block’s supported tribes. She’s a nice part of the Merfolk deck, but she also functions neatly in green decks in Standard all the same.